At 35, Craig Thompson has already written three previous books: Goodbye, Chunky Rice, Blankets and Carnet de Voyage. But it was Blankets that propelled Thompson’s reputation as one of the leading lights in comics. Weighing in at around 600 pages, it was a major work that received widespread acclaim from both the comics and the mainstream worlds, and still sells well alongside the greats like Joe Sacco and Chris Ware. With his new book, Habibi, he’s moved from comics publishers Top Shelf to mainstream trade publishers Faber, and although they are known much better for their poetry and literary fiction lists, they’ve pulled out all the stops with this. It’s an incredibly beautiful book, a real weighty tome, with careful attention to detail and high production values. They’ve taken a lot of the meticulous design that went into Thompson’s illustration and integrated it with the cover and endpapers, making a beautiful object of it. It’s just as long as Blankets, which might explain how it’s taken him so long to write. In a 2004 interview, Thompson originally said he’d try and get it completed by 2005. Seven years on, it’s easy to see where the time went: not just in the sheer length of the work, which is frankly epic by graphic novel standards, but in the research, the beautiful Arabic calligraphy, the interweaving of various religious texts and tales in between the main love story and in the incredible attention to detail, describing the intricate patterns and textures of his world. It is a real visual feast, with a fluent, quick plot but pages that you could stare at for minutes at a time. At the heart of this book, like his previous, is an unusual love story. We follow Dodola, a young slave girl who flees her captors with a baby called Zam, bringing her up on a strangely abandoned boat in the middle of the desert. As they grow up, they can’t keep the world around them from encroaching. Eventually Dodola is recaptured while Zam is out collecting water and we read on, desperately hoping they will be reunited. The book draws on the Thousand And One Nights with Dodola as the Scheherazade figure, storytelling often to put off her own death, to divert the attention of men and boys and guarantee her own safety. The preciousness of water and words reminds me a little of Salman Rushdie and his children’s book Haroun and the Sea of Stories, weaving in a rich tapestry of sources. Thompson pulls in stories from both the Bible and the Qu’ran, carefully throwing up the commonality of the Abrahamic religions. Of course, religion was writ large in Blankets, but in Habibi, rather than smothering the action, it provides a source of inspiration, wisdom and comfort. I think when an author has worked on a book for so long, and delivered such a huge work, it’s tempting not to hold them to their errors. It seems petty and ungenerous to keep too close an eye on the author’s individual choices, as if you’re complaining about the size of your dessert spoon at a banquet. But there are a couple of serious errors of judgment here, including the jarring use of the word ‘honkeys’ and an unexplained Cheshire cat during an opium scene. The problem with graphic novels is that, once the author’s got cracking, they’re on their own. No editor can save them from their idiosyncrasies. That said, Habibi is an incredibly rich and complex story. It’s wildly ambitious and could easily have fallen flat in the telling, but here it is, a modern fairy tale that already feels oddly timeless. Blankets was subtitled ‘an illustrated novel’ and that’s the feeling that I get from this book, too. 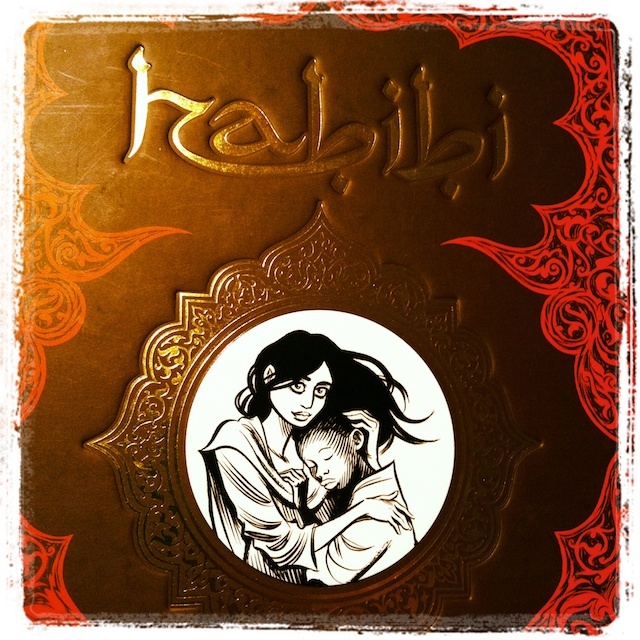 Habibi reads first and foremost like a novel, and it happens to be told in the language of comics, pushing out the boundaries of the form. If you’re interested in what a serious modern graphic novel can do, this is required reading. This entry was posted in Non-fiction, Review and tagged Blanket, Carnet de Voyage, Chris Ware, Craig Thompson, Faber, Good-bye Chunky Rice, Habibi, Middle East, One Thousand and One Nights, Thompson, Top Shelf. Bookmark the permalink.